Elite Resurfacing uses Liquid Tiles - an amazing interior concrete flooring system that can transform an ordinary concrete floor into the beautiful simulated look of seamless flooring or ceramic tiles. It’s a versatile, highly cost effective 3-5 mm polymeric cementitious coating that transforms the existing plain concrete or fibrous cement floors with a multitude of colours and subtle textures. Liquid Tiles is suitable for a wide variety of applications - shops, showrooms, factories, offices, kitchens, laundries, rumpus rooms etc. Liquid Tiles displays high compressive and flexural strength. With the use of specialist techniques, some amazing effects can be achieved. Liquid Tiles will not crack, lift or peel. 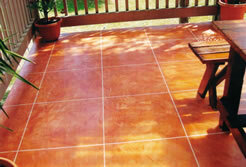 Liquid Tiles is a tough, hard wearing flexing system that is resistant to most household chemicals. Application is quick and easy with no mess. Its easy to clean and requires very little maintenance. From the large Shopping Centre and Retail Shops to your Living Room at Home! Create astonishing effects! 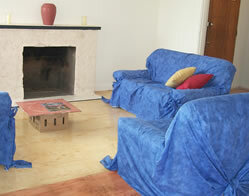 Decorative Concrete Floors are a new alternative to conventional floor coverings or polished concrete. Mention the CommunityGuide and receive a 5% discount. • Exterior Concrete : transform with a hard wearing concrete system, resistant to most stains, slip proof and available in stunning colours. • Interior: Transform your plain concrete floors to a simulated look of Sandstone, Limestone, Granite and even Timber over existing concrete or tiles. Guarantee provided for three years. This is an amazing new product which has now made liquid resurfacing possible on interior surfaces. It is stronger than concrete and half the price of the original tiling. Elite Resurfacing has been in the concrete industry for many years and has been involved in the decorative finish aspect for the last two years. Understanding the properties of concrete and the affect of resurfacing compounds is an important aspect of successfully using Liquid Tiles.